J. Robert Oppenheimer, "the father of the atomic bomb" was the first director of Los Alamos National Laboratory, beginning in 1943. 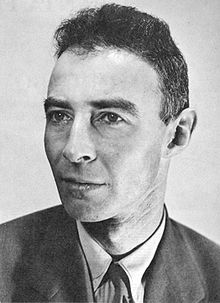 Julius Robert Oppenheimer (April 22, 1904 in New York City – February 18, 1967 in Princeton, New Jersey) was an American physicist of Jewish descent. He is best known as the scientific director of the Manhattan Project. In World War II, the project built the first nuclear weapons. That is why Oppenheimer is called "the father of the atomic bomb". "We knew the world would not be the same", he recalled the moments after the successful testing of the atomic bomb in New Mexico, United States years later. "A few people laughed, a few people cried, most people were silent. I remembered the line from the Hindu scripture, the Bhagavad-Gita. Vishnu is trying to persuade the Prince that he should do his duty and to impress him takes on his multi-armed form and says, 'I am become Death, the destroyer of worlds.' I suppose we all thought that one way or another." The quote from the Hindu scripture became one of Oppenheimer's most famous quotes. After the war he lost his security clearance and his job due to concern over nuclear espionage. He returned to teaching, and died of throat cancer, aged 62. Wikimedia Commons has media related to J. Robert Oppenheimer. This page was last changed on 25 July 2017, at 17:29.